IN THE VINEYARD: Use of prevention grape disease methods along cultivation instead of chemicals, cut of the infesting herbs, no irrigation or fertilization. THE HARVEST: Light drying of grapes still on the plant, manual harvesting with careful selection of grapes, transport by vacuum box truck. IN THE CELLAR: selection tables, destemming, soft grape crushing, maceration in 70 Hl stainless steel tank, contact skins-most for 3-4 weeks, temperature control at the top of pomace (Max T. 23-25°C), two delestage daily. After pressing, wine is put for 24 hours in stainless steel to remove dregs, then in French oak barriques (50 % in new barrels, 50% once-used barrels). Pomace pressing with hydraulic vertical press with stainless steel cage. Daily batonnage since the first decanting. After about 12 months of aging in wood without clarification and filtration and without tartaric deposit, the wine is bottled and maintained for further 6 months of aging in glass before consumption. "Doctorwine" has rated the wine "Gianfranco Fino 'Es' Primitivo di Manduria, Puglia, Italy" the vintage 2007 on 11.03.2015 with 94 of 100 points.
" An intense, almost impenetrable fiery red color. The intense bouquet has scents of Marasca and other cherries preserved under sprits and is spicy and balsamic as few wines can be. The mouthfeel is enormous, bold and wrapping and maintains an amazing balance and elegance considering its weight. " "Doctorwine" has rated the wine "Gianfranco Fino 'Es' Primitivo di Manduria, Puglia, Italy" the vintage 2011 on 14.01.2014 with 93 of 100 points.
" Our readers are well-acquainted with the story of Gianfranco Fino and his wife Simona. They produce two wines, Es and Jo, two indigenous grapes, Primitivo and Negroamaro. What Gianfranco puts in the bottle is extreme quality with no compromises allowed and maniacal attention is paid both in the vineyard and in the winery. This Es is a case in point, 100% Primitivo and produced in a limited number only for wine shops and restaurants. The grapes raisinate partially on the vine, the wine ferments in steel and then ages nine months in both new barriques and those that have already been used once. The color is a distinct ruby-red and the wine itself is awesome in both the nose and mouth. The bouquet has intense tones of black cherry and myrtle, aromatic wood, dark tobacco and sweet spice. The mouthfeel is soft and caressing, strong and authoritative, structured and agile and all this with a great freshness also. The aftertaste is savory and long. Amazing! " "Doctorwine" has rated the wine "Gianfranco Fino 'Es' Primitivo di Manduria, Puglia, Italy" the vintage 2008 on 04.07.2013 with 95 of 100 points.
" An intense, impenetrable red color, while the aroma is, as always, extraordinary with Noberasco prune, dark chocolate and black pepper. The mouthfeel is striking and saturating, with incredible finesses despite an unequaled boldness. 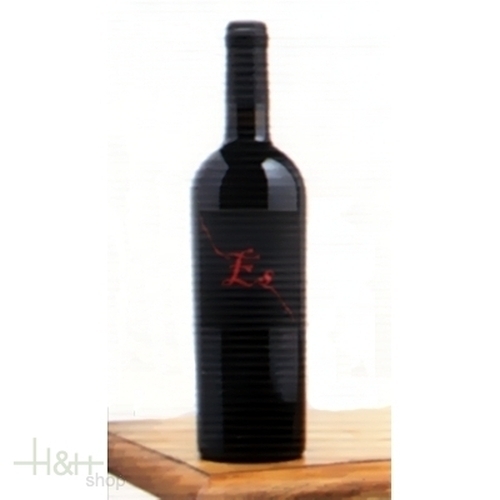 A wine that can spark heated discussions among wine lovers but that is a champion of its kind. Another wine to accompany strong-flavored foods or just to mediate on. " "Doctorwine" has rated the wine "Gianfranco Fino 'Es' Primitivo di Manduria, Puglia, Italy" the vintage 2010 on 18.05.2012 with 95 of 100 points.
" I hope the producer does not get angry with me since this vintage is still not on the market, but my enthusiasm and my desire to talk about it were too great and so I hope he will close a benevolent eye. The color has violet nuances typical of a youth that is almost embarrassing, while what is surprising is that the color is a little less impenetrable than usual and that it unleashes an unreal luminosity. The aroma is truly unusual for an ES, more cautious is expressing itself and with its many facets more articulated, very spicy, with some blood-like scents and a finish that is slightly vegetal. The taste is surprising, decidedly more austere and rigorous, with no concessions to the glyceric rotundness or flickering softness. The acidity is cutting and greatly increases is drinkability. They explained to me that the characteristics of the growing season produced this result, so I hope ti will be true for the other vintages as well given this surprising result. The finish is fantastic, long and rewarding. This is perhaps the best version of this wine seen so far, but then I said this about the 2009 as well, so we welcome this work-in-progress of such great satisfaction. " "Doctorwine" has rated the wine "Gianfranco Fino 'Es' Primitivo di Manduria, Puglia, Italy" the vintage 2009 on 18.05.2012 with 94 of 100 points.
" A reconfirmation of how good it has been in recent years. The product of a good harvest, it demonstrates an ever-growing balance of its components, where not only its boldness and richness attract a gourmand palate. The fact that it is 'so much' is because it complies with the characteristics of the grape, so we should never fear finding in the glass a sheer heroic transparency given that it sticks to the generous characteristics that define this grape. All that can be said of this wine has been said and it will just get better with age. " "Doctorwine" has rated the wine "Gianfranco Fino 'Es' Primitivo di Manduria, Puglia, Italy" the vintage 2006 on 18.05.2012 with 92 of 100 points.
" This is definitely a cut above for its overall balances, its red color is intense and almost impenetrable, the bouquet a variety of jams and red fruit, the taste opulent. " "Doctorwine" has rated the wine "Gianfranco Fino 'Es' Primitivo di Manduria, Puglia, Italy" the vintage 2004 on 18.05.2012 with 91 of 100 points.
" An historic and very rare bottle being the first vintage produced. The older it gets the better it gets. This version is fundamental to ascertain how the wine ages. It is unnatural already in its color, a flaming red without any chromatic reduction. The aroma is of average intensity with lush Mediterranean vegetation of bramble the Taranto coast and a spike of mineral. The taste is very rich, its balance is maintained by a nice acidity and alcoholic content apparently above the norm. It is becoming a precious jewel to be kept close for years to come. " "Doctorwine" has rated the wine "Gianfranco Fino 'Es' Primitivo di Manduria, Puglia, Italy" the vintage 2005 on 18.05.2012 with 90 of 100 points.
" To call it 'slight' makes me laugh but compared to the 2004 it is indeed fainter. The color is always a bright red but with moments of transparency. The bouquet is varietal of ripe fruit and this makes it a tasty version with pleasure united with rigor. " "Wine Spectator" has rated the wine "Gianfranco Fino 'Es' Primitivo di Manduria, Puglia, Italy" the vintage 2014 on 30.04.2017 with 92 of 100 points. "Falstaff Magazin" has rated the wine "Gianfranco Fino 'Es' Primitivo di Manduria, Puglia, Italy" the vintage 2014 on 12.10.2016 with 94 of 100 points. "Luca Gardini" has rated the wine "Gianfranco Fino 'Es' Primitivo di Manduria, Puglia, Italy" the vintage 2014 on 01.07.2016 with 87 of 100 points. "Luca Gardini" has rated the wine "Gianfranco Fino 'Es' Primitivo di Manduria, Puglia, Italy" the vintage 2013 on 01.07.2015 with 95 of 100 points. "Robert Parker The Wine Advocate" has rated the wine "Gianfranco Fino 'Es' Primitivo di Manduria, Puglia, Italy" the vintage 2013 on 30.04.2015 with 95 of 100 points. "Wine Spectator" has rated the wine "Gianfranco Fino 'Es' Primitivo di Manduria, Puglia, Italy" the vintage 2012 on 31.03.2015 with 92 of 100 points. "Vinum Wine Magazine" has rated the wine "Gianfranco Fino 'Es' Primitivo di Manduria, Puglia, Italy" the vintage 2012 on 01.03.2015 with 16 of 20 points. "Wine Enthusiast" has rated the wine "Gianfranco Fino 'Es' Primitivo di Manduria, Puglia, Italy" the vintage 2012 on 03.01.2015 with 89 of 100 points. "Luca Gardini" has rated the wine "Gianfranco Fino 'Es' Primitivo di Manduria, Puglia, Italy" the vintage 2012 on 01.07.2014 with 87 of 100 points. "Vinous Antonio Galloni" has rated the wine "Gianfranco Fino 'Es' Primitivo di Manduria, Puglia, Italy" the vintage 2011 on 01.03.2014 with 95 of 100 points. "Wine Spectator" has rated the wine "Gianfranco Fino 'Es' Primitivo di Manduria, Puglia, Italy" the vintage 2011 on 15.10.2013 with 90 of 100 points. "Luca Gardini" has rated the wine "Gianfranco Fino 'Es' Primitivo di Manduria, Puglia, Italy" the vintage 2011 on 01.07.2013 with 93 of 100 points. "Luca Gardini" has rated the wine "Gianfranco Fino 'Es' Primitivo di Manduria, Puglia, Italy" the vintage 2010 on 01.07.2013 with 91 of 100 points. "Vinous Antonio Galloni" has rated the wine "Gianfranco Fino 'Es' Primitivo di Manduria, Puglia, Italy" the vintage 2009 on 01.03.2011 with 93 of 100 points. "Vinum Wine Magazine" has rated the wine "Gianfranco Fino 'Es' Primitivo di Manduria, Puglia, Italy" the vintage 2007 on 01.05.2009 with 17 of 20 points.